The shores of Pearl Harbor were once dotted with twenty-two enclosed fishponds that were used by Native Hawaiians to farm fish. Of the twenty-two, only three remain relatively intact. The most accessible of these is Loko Pa’aiau, located adjacent to the McGrew Point Navy housing area. 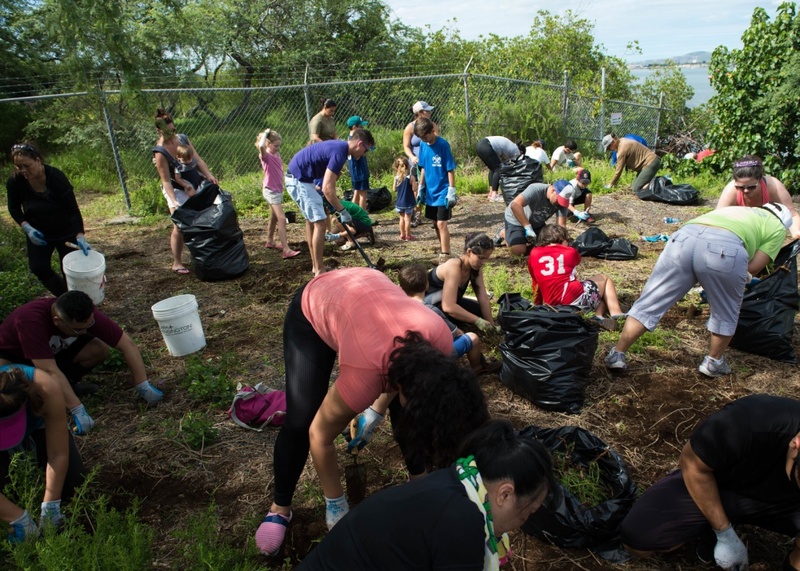 Since 2014, the ‘Aiea Community Association, the Ali‘i Pauahi Hawaiian Civic Club, and the United States Navy have worked together to begin the process of restoring this historic fishpond. Only five years ago, this area would have been an unrecognizable forest of mangrove trees. Thanks to the hard work of many individuals, the area is now cleared out. A preservation plan is in the works to work toward the restoration of the pond. In 2018, Historic Hawaii Foundation recognized the work of the Ali‘i Pauahi Hawaiian Civic Club, the ‘Aiea Community Association, and the Navy Facilities Engineering Command Hawai‘i with a Preservation Award. Kehaulani Lum and Bruce Keaulani represented the ‘Aiea Community Association at the awards ceremony, which took place on May 23rd at the YWCA Laniakea.